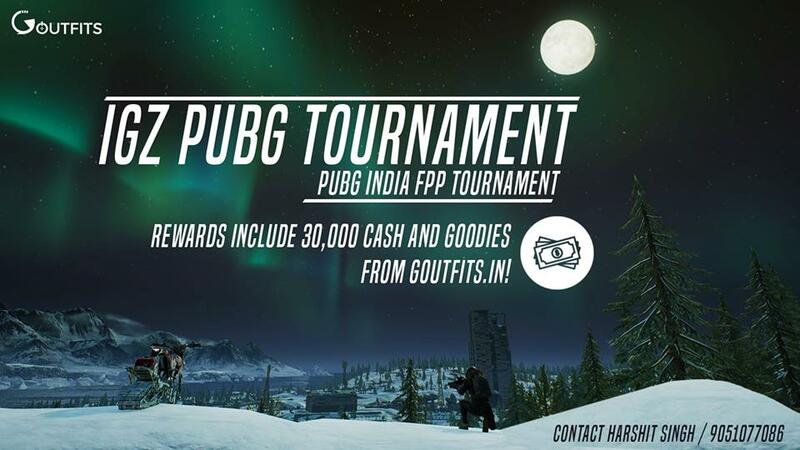 In association with IGZ and Goutfits, PUBG PC tournament is coming with cash prizes and goodies worth INR 30,000. The tournament is organized by one of the PUBG community leaders, Harshit Singh. The dates of the tournament are locked on 16th, 17th and the 24th of February. Further, the games will take place in First Person Perspective (FPP) on Erangel & Miramar in Sunny weather. The registration of the IGZ PUBG PC tournament begins from 1st of February. Interested participants can play the event for free. The prize pool is going to consist of a cash prize worth INR 30,000 split among the top 3 teams and goodies sponsored by Goutfits. 32 teams registered will be divided into 2 lobbies of 16. 8 teams from each lobby progress to the finals and take on each other for the top spot. Matches for Lobby 1 will be played on the 16th of February and Lobby 2 on the 17th of February. Top 8 teams from each lobby progress to battle each other out in the finals on the 24th of February. The map structure will be same for all 3 days, i.e., 4 maps each (Erangel – Miramar – Erangel – Miramar). The points system, map setup, and everything will be available soon on IGZ facebook page. Additionally, participants can contact Harshit Singh, the organizer of the tournament. More information on IGZ Facebook page, Harshit Singh: +91 (905)1(zero)77086.